The Napier Runner Bike is the smallest and cheapest bike in the Hoy Bikes range. It's a balance bike, aimed at the youngest of riders as an introduction to cycling. It isn't just a flimsy toy, though. Hoy pride themselves on the fact that it's built by the same people that make the rest of their range, using high quality components. Decent quality tubing, a proper headset, and good quality rims and bearings set it apart from other balance bikes on the market. 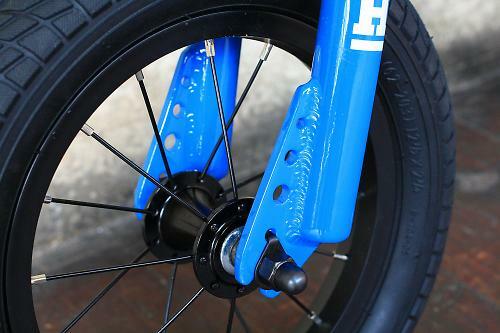 It really is part of the Hoy Bikes family, not just a bolted-on gesture to fill a gap in the marketing plan. 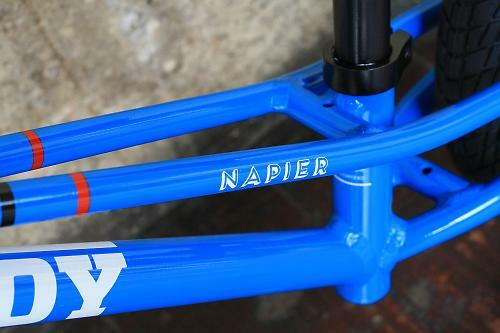 The Napier has a distinctive BMX look to it, reflecting Hoy's early years as an enthusiastic BMXer. The Napier name is also taken from Sir Chris's childhood – it's the name of the school playground where the Scotsman learned to ride his first bike. 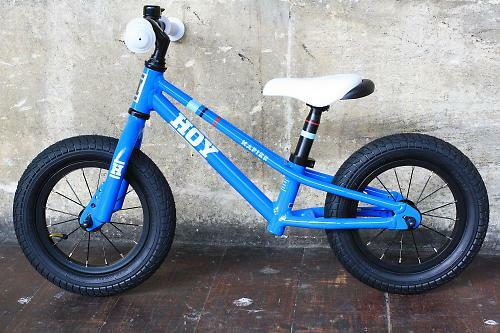 Our bright blue review model, with the Hoy Bikes signature, and blue, black and red striped detailing, 'HOY' in bold lettering across the down tube and 'H' stamped on the BMX-styled fork and head tube, is a really stylish looking bike. The stated age range for the bike is two-to-five years old, or a height range of 85-110cm. Going by height is probably a better way to gauge the sizing, as smaller two-year-olds will struggle to reach the bar or get their feet flat on the floor. Hoy provide a handy measurement guide for all their kids' bikes here. The seatpost can be raised/lowered with a standard Allen key bolt, and with a range of 110mm there's plenty of room for growing. 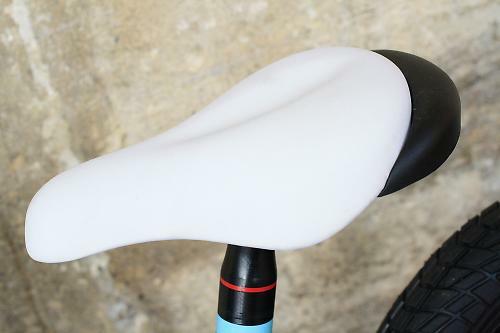 Arguably the saddle doesn't quite go low enough for the smallest of riders, so a slightly shorter post would be good. Charlie stands at 97cm tall and has an inside leg measurement of 40cm, and just about got by with the saddle at its lowest setting. The frame and fork are constructed from HOY 6061 aluminium tubing; it feels sturdy without being too heavy. The whole bike weighs in at 5.9kg, which is about average compared with similar bikes on the market. The top tube has a split tube design and sweeps down at a steep angle, making it easy for small legs to be swung over the top. The 25.4mm bar is narrow enough for small hands to grip, and with a slight back sweep, at 450mm wide makes for a stable position when steering comes on the agenda. The dimpled rubber grips are a contrasting white colour (although they swiftly turn grey with mucky hands) and there's a bell that WILL be rung constantly, so much so that you'll be convinced you can hear it in your sleep. One thing that is missing is a brake, not an essential by any means, but some balance bikes at a similar price point do include a back brake. It's certainly not needed for scooting along at slow speeds but would be useful as an introduction to braking as kids reach the upper end of the Napier's age range and look to move on to a pedal bike. 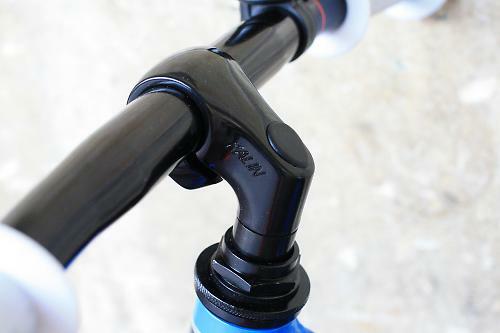 There is a quill stem and a headset with proper bearings at the front end. Youngsters won't notice much difference here, but it'll keep the bike in good nick for longer and allow it be passed on to younger siblings, and give it better resale value. The wheels are solid enough too: 12-inch alloy rims, steel spokes and Joytech hubs, a step up from the plastic offerings on cheaper models. 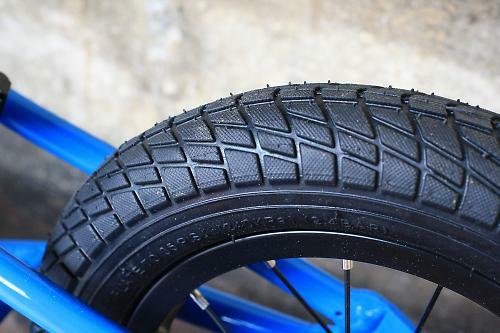 Chunky Kenda tyres and tubes finish off the wheels, allowing for a comfy ride as the bike scoots across a variety of different terrains (including freshly planted flowerbeds - grrr!). Angled valves are also a nice touch, making it less fiddly to attach a pump. Another absence from the design is any kind of footplate. Again it's not a deal breaker when looking for a balance bike, but definitely something to consider. It just allows somewhere for little riders to tuck their feet once they pick up some speed and start to practise balancing for longer stretches. The Napier Runner Bike is, like the rest of the Hoy Bikes range, available exclusively through Evans Cycles and retails at £110. It comes in the one size and there are blue, red, yellow and green colour options, a nod towards the world champ stripes Sir Chris wore on so many occasions, and something to suit all toddler colour palettes. Balance bikes tend to range from around £40 up to £150, so this one is nudging into the top tier. Shelling out £110 on a bike for a three-year-old does seem like a lot of cash, and there are certainly a lot of cheaper options out there, but it's worth remembering this is a well built bike. It will easily be passed down from child to child and will no doubt hold a decent resale value once finished with. For more advice on choosing and buying a first bike for your child, check out our buyer's guide. The Hoy Napier Runner Bike is a balance bike aimed at kids from 2 to 5 years old as an introduction to cycling. The build quality is really good for a kid's bike, Hoy take particular pride in mentioning it's constructed by the same people that make the rest of their range. Good components and a headset and hubs with proper bearings mean this bike should last the test of time. A good quality bike that's built well with decent components and worth shelling out for, but it would be nice to see a brake or footplate at this price point. Really well, robust, fun and looks good. The styling and build quality. The lowest saddle height was a little too high for smaller riders. Did you enjoy using the product? Yes, Charlie had great fun on it. It's a really good bike, it looks cool and performs well, and it's obvious it will last the test of time. At this price point I'd like to see a rear brake included and it would be good to take another inch of so off the seatpost to accommodate smaller riders.